To find a home call center job (aka virtual call center), start by researching potential companies carefully. Though there are many legitimate companies hiring work at home call center agents, call center jobs (as well as data entry jobs) are often used at the bait in work-at-home scams. Most legitimate jobs at virtual call centers require an investment in home office equipment, and some do charge fees. So before you spend any money to get set up as a work-at-home call center agent, ask some questions. And if you are interested in comparing a home-based job in this field to one in an office, read ​5 Things to Know About Home Call Centers. What Type of Work Does the Company Offer Home Call Center Agents? Does the Company Hire Where I Live? Even though it seems like home call center work can be done from anywhere, many companies only hire from certain locations. See these lists of home call center jobs by location to find companies that hire in your area: Call Centers in Canada and Call Centers by U.S. State. Call center home office requirements vary from company to company. But at a minimum, you'll need an up-to-date computer and a land phone line. For the most part, you should not have to buy specialized equipment for one particular employer. The equipment and software should be basic, general equipment that could be used for different employers. Some companies require that you work in a room with a door to minimize distractions. But even if a door is not required, you will need to plan for childcare if your children are young enough require your attention. Does the Company Charge Any Fees to Applicants? As a general rule, employers pay workers--not the other way around. Work-at-home scams try to collect bogus fees, so beware of any company that charges anything. That said, a few legitimate companies do require potential workers to pay a one-time fee for a background and credit check. This is often around $50, but you should not have to pay for this until a position is offered (conditioned on a satisfactory background check). What Skills Are Needed to Become a Work at Home Call Center Agent? There are also a lot of opportunities for bilingual call center agents. 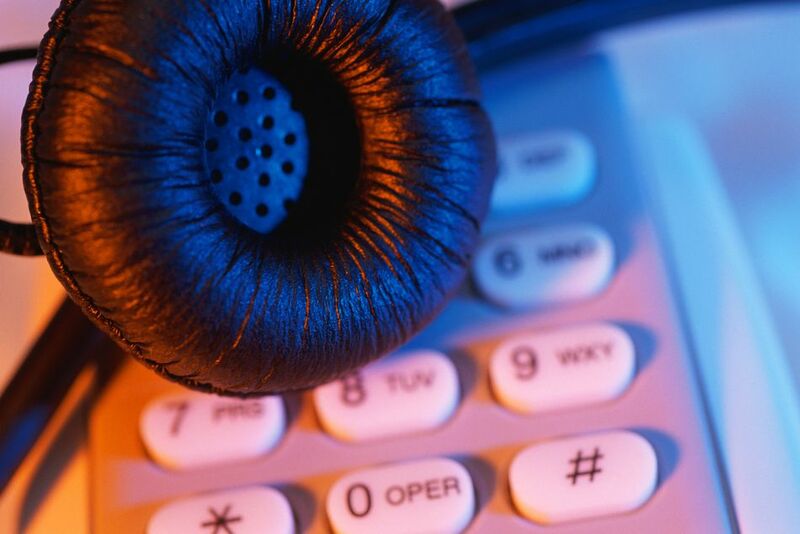 Read more about call center agent qualifications. On What Basis Will I Be Paid? Work-at-home call center agents are often paid a per minute, per call or per hour rate. Agents compensated on a per call or per minute are paid only for time spent on the phone, not for time waiting for calls to come in. For those paid per call, obviously moving quickly through calls means more money. If the job is a sales position, be sure you understand all the details of the sales incentive pay plan. What is the commission? Is there a minimum base pay? Will the company provide sales leads? For more information on salaries, see this article on Call Center Pay Structures. Are Home Call Center Agents Employees or Independent Contractors? Companies hire home call center agents both as employees and as independent contractors. Whether you are an independent contractor or an employee makes a difference in your taxes. Typically for independent contractors, companies do not withhold payroll taxes. However, they do report income to the IRS, who will expect you to pay taxes on it. Independent contractors are less likely to be paid an hourly rate than employees, although employees are not always paid an hourly wage. Keep in mind that employers should guarantee the minimum wage. For instance, if an employee is paid at a per-call rate and no calls come in, the employee should at least be paid minimum wage. Independent contractors are not subject minimum wage or overtime laws. This sounds like a simple question, but it is not. Compensation for work-at-home agents is often quite complicated. Even if the company pays per hour, there could be different hourly rates for each of the company's various clients. And if you are paid on a per call or per minute basis, find out if there is a minimum you can expect if no or few calls come in. Whether you are paid by the hour or not, try to determine your average hourly pay, so you can compare one job to another. Don't forget to factor in home office costs, like an additional phone line or virus protection subscription. And when comparing a home-based job to a work-outside-the-home job, you may want to factor in savings on child care and commuting costs. Again, this is as complicated as figuring out how much you will be paid. Some companies require a minimum commitment of time, while others require no minimum number of hours nor promise any. Some may require that you work weekends or nights, while others may not offer hours at those times. Those that hire independent contractors may offer work on a project basis for individual clients. So when a particular client's needs are fulfilled, you may need to reapply for a new client's work. If you prefer part-time work, check out this list of part-time virtual call center jobs. All work-at-home call center jobs will require some training, but how much will vary depending on the type of work and the company. Companies that hire agents to work for clients may need to retrain agents when they move to a new client. The most reputable companies will pay you for training, but some companies don't. A few will actually charge you for training but avoid these companies. What is the application process? How long does it take? Is this work available in my state? If I move, can I take my job with me? Do I have to be a U.S. citizen? For companies that hire agents as employees, do you offer benefits?